This report, prepared by scholars and human rights advocates who are members of the Working Group on Violence against Women with Disabilities, focuses on the prevalence and pervasiveness of violence against women and girls with disabilities. The Working Group recognizes the need to ensure that women and girls with disabilities are included as full participants in data-gathering, analysis, and proposed solutions as the mandates of Ms. Rashida Manjoo, the UN Special Rapporteur on Violence against Women, its Causes and Consequences, and Mr. Shuaib Chalklen, the Special Rapporteur on Disability, move forward. Additionally, the Working Group calls on international organizations, especially those focused on women’s rights such as the UN Commission on the Status of Women (which will consider as its priority thematic issue violence against women at its 57th session in March 2013) and UN Women, and the international community, governments and non-governmental organizations (NGOs) to join us in the effort to highlight these critical issues. Because women with disabilities make up a significant part of the world’s population, principles of fairness and equality require that the world engage in a vigorous discussion on how to end violence against them. According to the World Health Organization (WHO) and the World Bank (WB), more than one billion people (approximately 15% of the world’s population) live with some form of disability. Significantly, for the World Bank and World Health Organization disability level threshold of 40, which includes those experiencing significant difficulties in their everyday lives for both low income and high income countries, the male disability prevalence rate is 12 with standard error .18 and the female disability prevalence rate is 19.2 with standard error .19. Based on these figures, it is clear that women with disabilities constitute a significant portion of the global population and that the pervasive violence against women with disabilities must be addressed. The 2011 Report of the United Nations Special Rapporteur on Violence Against Women focused on the multiple and intersecting forms of discrimination that contribute to and exacerbate violence against women, noting that factors such as ability, age, access to resources, race/ethnicity, language, religion, sexual orientation and gender identity and class can exacerbate the violence women experience. Although women with disabilities experience many of the same forms of violence all women experience, when gender and disability intersect, violence takes on unique forms, has unique causes, and results in unique consequences. Further, women with disabilities who are also people of color or members of minority or indigenous peoples, or who are lesbian, trans-gender or intersex or who live in poverty, can be subject to particularized forms of violence and discrimination. These intersections must be explored in greater depth to ensure that the complexities of violence against women with disabilities are properly understood and addressed. Zara Todd on ITV news: Will the Paralympic Games change opinions on disabled people? We are proud to share this from one of our Sisters, Maria Zedda of Wideaware, this resource. This is very useful when planning your train travel. 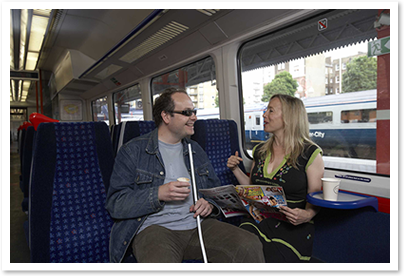 is produced by the Association of Train Operating Companies (ATOC) and is designed to help disabled passengers, and others who might encounter practical difficulties, make use of the help and resources available for planning a barrier-free train journey in Great Britain. Our aim is to encourage as many disabled customers to use the railway as possible. As track and station operators are still working on removing as many barriers as possible, we hope that this website will help you to make informed choices about your travel plans, identify any potential barriers that might affect your journey, and find ways to avoid these difficulties. Khairani Barokka:poet/disability & arts advocate at Bare Lit Festival 2016! Zara Todd : Have you always been disabled?